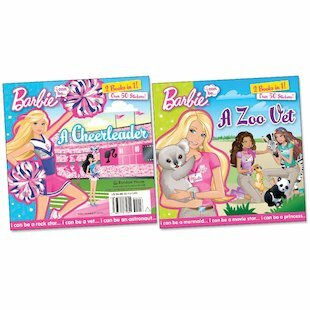 Aspirational fun with Barbie, in a pretty flip book with stickers. She can be a vet, a cheerleader and much more – anything she wants to be, in fact! Read about Barbie as she takes care of koalas, pandas and dolphins at the zoo, and helps her favourite team by cheering them on with chants and dance moves. This deluxe book brings readers two stories in one, plus four beautiful sheets of stickers. Girls will be cheering with joy!